A classless act, but it's nothing new from Winburn. This is interesting to say the least. Is there, in fact, going to be a "special session" of City Council. Does that have some formal, legal meaning. I hadn't realized scrutinized the email when I received it, but this almost seems deceptive if it's just a faux gathering for Winburn, Lippert & Murray. Perhaps I'm not understanding what they're actually doing. Turn off the cameras & see if the Windbag even shows up. 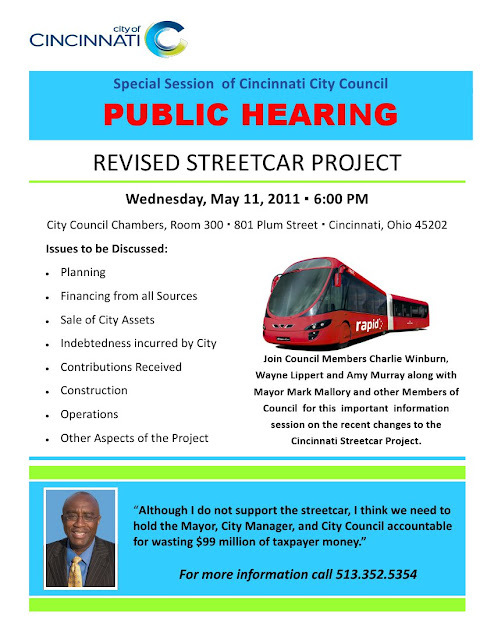 Why is Winburn showing a picture of a bus on his flyer for a special meeting about the recent changes to the Cincinnati Streetcar? Randy FTW! Looks to me, a sleeker version of an articulted bus, not unlike something Cincinnati already has now! He probably was given the image by COAST.